Individual or group therapy is available after a complimentary consult with the therapist. Circle Rock Retreat offers a safe and private environment for the comfort of our clients. The mountain setting allows for a unique therapeutic process. Our experiential orientation may include movement and/or interaction with the environment to help clients find thier own skills and strengths. 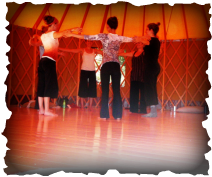 Our beautiful yurt, equiped with a hard wood floor, is an ideal space for body based therapies, including Authentic Movement and The Moving Cycle. The body, mind, and spirit will be active in this lovely venue. Whether you are a professional artist or an individual seeking creative ways to move through life, come play at Circle Rock Retreat. We are currently designing creativity retreats that combine dance/movement, visual arts, journaling, contemplative nature walks, and storytelling. Exploration through multiple art forms has the potential for powerful artistic growth!